NICOLAS CLÉRAMBAULT (1676-1746): Cantatas Apollon, Le jaloux, L’amour, guéri par l’amour, Pirame et Tisbé. Description: In his lifetime and ever since Clérambault’s reputation has been founded on his cantatas: five books comprising a total of twenty cantatas, and five single works. The four offered here, dating from the period 1710-20, enable us to follow his evolution from an ornamented idiom, close to that of Raison and Nivers, to a pure classical style. French-English texts. 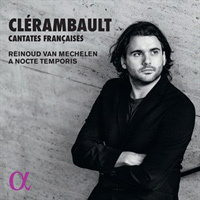 Reinoud van Mechelen (tenor), A Nocte Temporis.